It's especially good to see this angle covered so well by Teen Vogue. 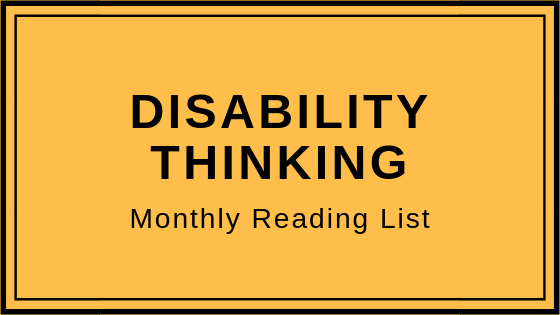 Much of its audience is either in or approaching college, and just beginning to shape how they think about disability accommodations in academics. Whether or not "Medicare For All" is a politically realistic possibility at the moment, it's incredibly important to map out what disabled people need from any health insurance system. I have a disability everyone can see. My bipolar friend who died by suicide did not. This is a very good head-on exploration of the sometimes difficult relationship between the community of physically disabled people and people with mental illness. Frankly, you don't have to look very hard to find Dr. Phil being sloppy and unnecessarily insulting on his show. And a couple of his quotes alone speak for themselves. But this piece nicely underscores the core problem with his recent show on "interabled" couples. Betsy DeVos’s threats to the Special Olympics are cruel. But disabled people have bigger problems. Problems with disabled people's health care, critical benefits, and basic civil rights never seem to "catch fire" with the public, while certain high-profile disability causes garner a disproportionate amounts of sympathy and outrage. This kind of thing is completely understandable and at the same time legitimately frustrating.